Situated in the Gulf of Tonkin, the bay spreads over around 150,000 hectares and includes close to 2,000 limestone islands and karsts emerging from pristine waters. Most islands are uninhabited and covered by dense, green foliage, giving the area a feeling of pure serenity. There are countless places to see and explore here and just as many ways to do it. 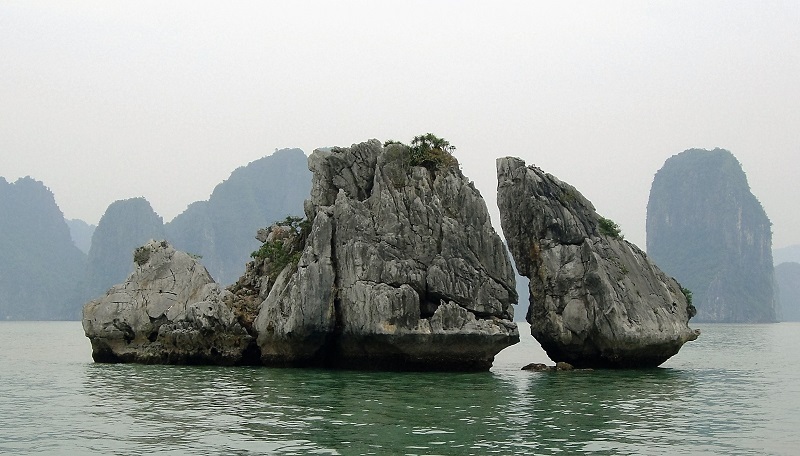 The climate in Ha Long Bay is tropical with two main seasons: a hot, wet summer and a dry, cool winter. Average temperatures go from 15 °C – 25°C. The best time to visit this area is from March to May and from September to November. During these months, the weather is largely dry and quite pleasant, especially if you are not used to heat and humidity. At this time, you’ll also find the largest variety of interesting activities available, so if you’re planning on spending a few days and trying plenty of different things, this is the time to go. 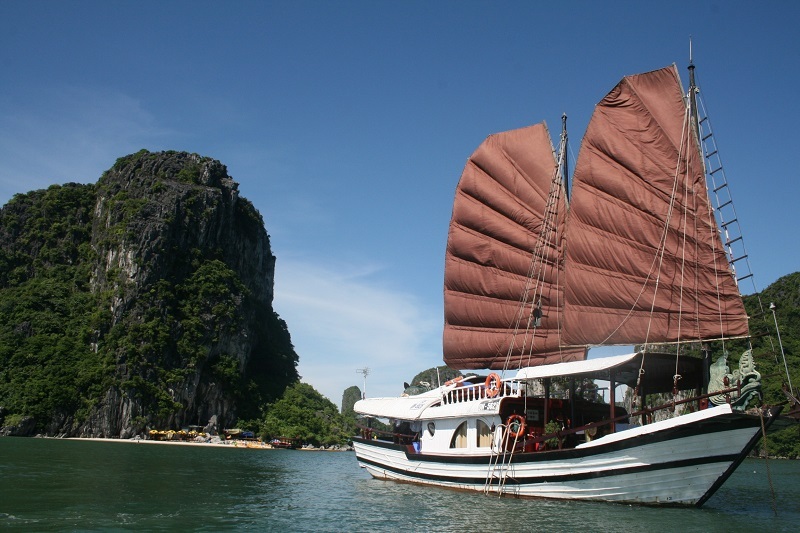 The low season in Ha Long Bay is from May to September. It can get pretty hot during this time which is why fewer people travel then. If you’re on a budget, you might want to consider these months as you will likely get a good deal from most cruise companies. Going early in the year, from January to March, will assure you cool weather but you risk having a lot of fog. While this can create a beautiful, eerie atmosphere, you might find that you would have preferred November’s clear blue skies for better views and nicer photos. July and August should be avoided as they can be quite stormy and rainy. At best you will face a lot of mist and low visibility, and at worst, your cruise or other activities might be canceled (or extremely uncomfortable) due to turbulent weather, strong winds and waves. Whether you want a relaxing trip to enjoy time with your family and friends or prefer the occasional adrenalin rush and exciting outdoor activities, Ha Long Bay offers something for everyone. While some cruises offer the chance to relax on spacious decks and take in the amazing views, others will let you take a kayak to explore your surroundings more closely. Tired from all the paddling? Make sure your cruise includes a stop at a quiet beach where you can relax and enjoy the sun. Or maybe you prefer a crazy party with fellow backpackers from around the world? This too can be arranged! Ha Long Bay is home to countless islands, which can make it feel a bit overwhelming to choose which ones you want to include on your trip. Depending on your cruise packages, you will be stopping at some of the most popular islands, but if you feel like you’re missing out, you can always catch a boat on your own to get to the places you really want to see. The largest island in the area, Cat Ba is where many visitors start their tour of Ha Long Bay. But there’s a bunch to see on the island itself as well, such as the national park which covers most of the island and some interesting remnants of the Vietnam War. While the main town is nothing special, you can enjoy the pristine nature, untouched jungle and beautiful beaches here. The wonderful and rather quiet Lan Ha Bay can also be reached from Cat Ba, so if you have some extra time, this is something you should add to your itinerary. If beaches are your thing, this place is for you. Plan a stop here to spend some time on the famed Ti Top beach with its fine white sands and crystal-clear water. Lay out in the sun, sip a cocktail and enjoy the views of the bay and the lush, green landscape surrounding you. And even if beaches are not so much your thing, Dao Ti Top is worth a visit to discover the tropical forests and enjoy delicious local cuisine. Another beautiful destination to include in your itinerary is Dau Be island. It’s known for its stunning landscape and rock formations, complete with lakes and caves. The adventurous traveler will find their joy here while exploring hidden nooks and crannies and leaving the crowds behind. Another larger island in Ha Long Bay is Ban Mun Island. Stop here if you are looking for beach less frequented than Ti Top but with equally beautiful tropical greenery and breathtaking landscapes. If you’re venturing out of Ha Long Bay into the neighboring Bai Tu Long, make sure this island is on your list. It’s not nearly as well known as some of the others and therefore offers quiet beaches perfect for a relaxing afternoon. Hotels and hostels here are very simple and basic, so if you’re a budget-minded traveler, this is your paradise. Also located in Bai Tu Long, Cong Do is a fun place with several things to see. It features one of the highest mountains in the bay, a salt lake home to plenty of local plants and wildlife and an interesting old port that has played an important role in sea trade for many years. Of course, there are plenty more islands to see! To make the choice easier for you, we’ve created a more detailed guide on Ha Long Bay’s many islands for you, which will be released soon. Check it out to find the best destinations for your trip, learn how to get there and find your way around. With the many wonderful islands and pristine waters, it comes as no surprise that there are tons of activities to take part in while you are exploring Ha Long Bay. While booking your cruise, be sure to check what they include and pick the one with the things that most interest you. Also, be aware of what is inclusive in the price and what you will have to pay extra to avoid any unpleasant surprises. The most common activities by far are kayaking, swimming, and beach games. The bay’s gentle waves and countless beaches pretty much make these past-times a must. You can also get tours of the many caves, most notably Hang Sung Sot or Thein Cung. It’s like stepping into another world full of eerie yet enchanting sights and sounds. Many visitors also enjoy treks on some of the islands’ hills and through the tropical forests. That way you get a great feel for the local flora and fauna and see an unforgettable close-up of Ha Long that you’d miss if you stayed on the boat. The way to explore Ha Long Bay is by boat so you can get out into the bay and see the beautiful limestone formations and their lush greenery up close. But the sheer volume of tour boats and cruises available can make it hard to know which one is the right one. There are many operators offering tours for all kinds of different budgets so do some careful research and read past visitor’s reviews to avoid falling prey to the numerous scams. Do you love seafood? Then you’ve come to the right place! If you’ve already been traveling around Vietnam for a while you will probably have tasted great dishes already, but Ha Long Bay takes this to a whole new level. Here you are right at the source for some of the country’s most popular dishes, so be sure to try the following specialties and the many dishes made with them. 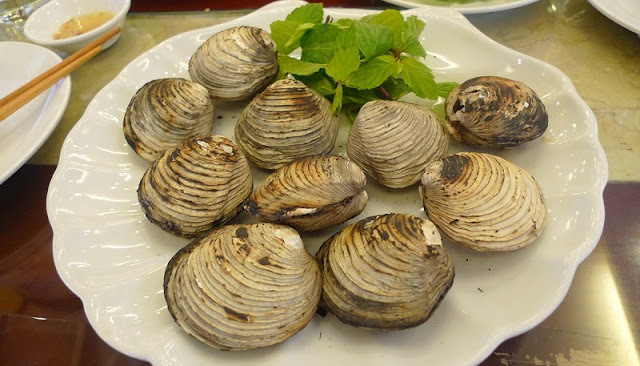 This mollusk is similar to clams but quite different in its flavor. While you can find it along most of Vietnam’s coast, Ha Long and the surrounding area is where it gets its fame. There are many ways you can enjoy Ngan. Depending on the chef and which dish he’s preparing, Ngan will be steamed, boiled or grilled and be served with rice or other vegetables. If you’re up for it, you can even have it for breakfast with some porridge. For the really courageous, there is Ngan blood wine, a liquor mixed with the juice of the mollusk. Interested? The variety of snails in Ha Long Bay is close to endless. And the supply is so rich that there are entire restaurants that dedicate themselves to serving this delicious seafood. Take the time and try the snails in different restaurants and you’ll see some of the beautiful varieties. Typically, they serve this with a tangy sauce made of fish sauce, rice vinegar, chili, sugar, and ginger. The snails come in all shapes and sizes, so if you wash and clean a few of them after your meal they will make a beautiful souvenir of your trip. Ha Long Bay is home to a rich variety of shrimp but the most popular, among both locals and foreign visitors are the prawns and lobsters. Local preparations of these exclusive specialties include breading and frying them or steaming them together with a combination of herbs and spices to bring out the light natural flavor. Whether or not you consider yourself a serious foodie or gourmand, this is something you don’t want to miss out on. While it might seem like a lot to research and plan, a trip to Ha Long Bay is more than worth the effort. Do your homework to make sure you have an unforgettable experience in one of nature’s seven new wonders of the world. Cruising around the countless islands and karsts is an incomparable experience you will remember and cherish for a lifetime.